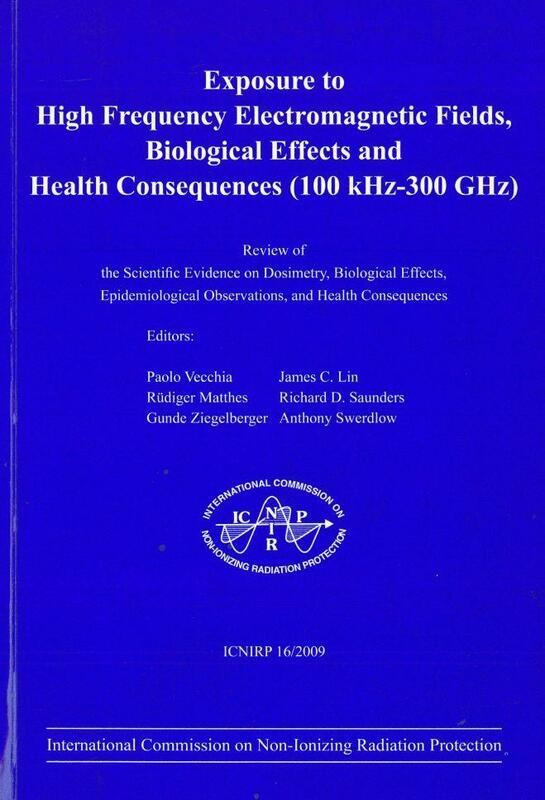 Exposure to high frequency electromagnetic fields, biological effects and health consequences (100 kHz-300 GHz) - Review of the Scientific Evidence and Health Consequences. Munich: International Commission on Non-Ionizing Radiation Protection; 2009. Content: This document is a review of the scientific evidence concerning exposure to high frequency electromagnetic fields and the resulting consequences for health. Since the 1998 publication of the ICNIRP guidelines on limiting exposure to electromagnetic fields, there have been important studies published, that needed detailed analysis and discussion to determine their implications for health. The review aims at providing input to the respective health risk assessment undertaken by the World Health Organization. Together with the review of the scientific evidence in the ELF range this forms the basis for a thorough reevaluation of ICNIRP's science based guidance on limiting exposure to EMF.